Australia, formally the Commonwealth of Australia, is a country and sovereign state in the southern hemisphere, located in Oceania. Its capital city is Canberra, and its largest city is Sydney. Australia is the sixth biggest country in the world by land area, and is part of the Oceanic and Australasian regions. Australia, New Zealand, New Guinea and other islands on the Australian tectonic plate are together called Australasia, which is one of the world's great ecozones. When other Pacific islands are included with Australasia, it is called Oceania. 25 million people live in Australia, and about 80% of them live on the east coast. The country is divided up into six states and two territories, and more than half of Australia's population lives in and around the cities of Sydney, Melbourne, Brisbane, Perth and Adelaide. Australia is known for its mining(coal, iron, gold, diamonds and crystals), its production of wool, and as the world's largest producer of bauxite. Its emblem is a flower called the Golden Wattle. Australia's landmass of 7,617,930 square kilometers is on the Indo-Australian plate. The continent of Australia, including the island of Tasmania, was separated from the other continents of the world many millions of years ago. Because of this, many animals and plants live in Australia that do not live anywhere else. These include animals like the kangaroo, the koala, the emu, the kookaburra, sheep, and the platypus. People first arrived in Australia more than 50,000 years ago. These native Australians are called the Australian Aborigines. For the history of Australia, see History of Australia. Most of the Australian colonies, having been settled from Britain, became mostly independent democratic states in the 1850s and all six combined as a federation on 1 January 1901. The first Prime Minister of Australia was Edmund Barton in 1901. Australia is a member of the United Nations and the Commonwealth of Nations. It is a parliamentary democracy and a constitutional monarchy with Elizabeth II as Queen of Australia and Head of State and a Governor-General who is chosen by the Prime Minister to carry out all the duties of the Queen in Australia. Australia has six states, two major mainland territories, and other minor territories. The states are New South Wales, Queensland, South Australia, Tasmania, Victoria, and Western Australia. The two major mainland territories are the Northern Territory and the Australian Capital Territory (ACT). In 2013 according to world bank Australia had just over 23.13 million people. Most Australians live in cities along the coast, such as Sydney, Melbourne, Brisbane, Perth, Darwin, Hobart and Adelaide. The largest inland city is Canberra, which is also the nation's capital. The largest city is Sydney. Australia is a very big country, but much of the land is very dry, and the middle of the continent is mostly desert. Only the areas around the east, west and south coast have enough rain and a suitable climate (not too hot) for many farms and cities. Photograph of Arrernte men of Central Australia in a Corroboree in 1900. The Australian Aboriginal people arrived in Australia about 50,000 years ago or even earlier. Until the arrival of British settlers in 1788, the Aboriginal people lived by hunting and gathering food from the land. They lived in all sorts of climates and managed the land in different ways. An example of Aboriginal land management was the Cumberland Plain where Sydney is now. Every few years the Aboriginal people would burn the grass and small trees.[source?] This meant that a lot of grass grew back, but not many big trees. Kangaroos like to live on grassy plains, but not in forests. The kangaroos that lived on the plain were a good food supply for the Aboriginal people. Sometimes, Aborigines would name a person after an animal, and they could not eat that animal to help level out the food population. Aboriginal people did not usually build houses, except huts of grass, leaves and bark. They did not usually build walls or fences, and there were no horses, cows or sheep in Australia that needed to be kept in pens. The only Aboriginal buildings that are known are fish-traps made from stones piled up in the river, and the remains of a few stone huts in Victoria and Tasmania.[source?] The Aboriginal people did not use metal or make pottery or use bows and arrows or weave cloth. In some parts of Australia the people used sharp flaked-stone spearheads, but most Aboriginal spears were made of sharply pointed wood. Australia has a lot of trees that have very hard wood that was good for spear making. The boomerang was used in some areas for sport and for hunting. The Aboriginal people did not think that the land belonged to them. They believed that they had grown from the land, so it was like their mother, and they belonged to the land. In the 1600s, Dutch merchants traded with the islands of Batavia (now Indonesia), to the north of Australia and several different Dutch ships touched on the coast of Australia. The Dutch governor, van Diemen, sent Abel Tasman on a voyage of discovery and he found Tasmania, which he named Van Diemen's Land. Its name was later changed to honour the man who discovered it. The British Government was sure that there must be a very large land in the south, that had not been explored. They sent Captain James Cook to the Pacific Ocean. His ship, HMS Endeavour, carried the famous scientists, Sir Joseph Banks and Dr Solander who were going to Tahiti where they would watch the planet Venus pass in front of the Sun. Captain Cook's secret mission was to find "Terra Australis" (the Land of the South). The voyage of discovery was very successful, because they found New Zealand and sailed right around it. Then they sailed westward. At last, a boy, William Hicks, who was up the mast spotted land on the horizon. Captain Cook named that bit of land Point Hicks. They sailed up the coast and Captain Cook named the land that he saw "New South Wales". At last they sailed into a large open bay which was full of fish and stingrays which the sailors speared for food. Joseph Banks and Dr. Solander went ashore and were astonished to find that they did not know what any of the plants or birds or animals that they saw were. They collected hundreds of plants to take back to England. Captain Cook saw the Aboriginal people with their simple way of life. He saw them fishing and hunting and collecting grass seeds and fruit. But there were no houses and no fences. In most parts of the world, people put up a house and a fence or some marker to show that they own the land. But the Aboriginal people did not own the land in that way. They belonged to the land, like a baby belongs to its mother. Captain Cook went home to England and told the government that no-one owned the land. This would later cause a terrible problem for the Aboriginal people. 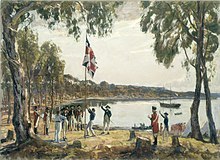 Captain Arthur Phillip raises the British flag at Sydney in 1788. In the 1700s, in England, laws were tough, many people were poor and gaols (jails) were full. A person could be sentenced to death for stealing a loaf of bread. Many people were hung for small crimes. But usually they were just thrown in gaol. Often they were sent away to the British colonies in America. But by the 1770s, the colonies in America became the United States. They were free from British rule and would not take England's convicts any more, so England needed to find a new and less populated place. By the 1780s the gaols of England were so full that convicts were often chained up in rotting old ships. The government decided to make a settlement in New South Wales and send some of the convicts there. In 1788 the First Fleet of eleven ships set sail from Portsmouth carrying convicts, sailors, marines, a few free settlers and enough food to last for two years. Their leader was Captain Arthur Phillip. They were to make a new colony at the place that Captain Cook had discovered, named Botany Bay because of all the unknown plants found there by the two scientists. Captain Phillip found that Botany Bay was flat and windy. There was not much fresh water. He went with two ships up the coast and sailed into a great harbor which he said was "the finest harbor in the world!" There were many small bays on the harbor so he decided on one which had a good stream of fresh water and some flat shore to land on. On 26 January 1788, the flag was raised and New South Wales was claimed in the name of King George III of England, and the new settlement was called Sydney. For the first few years of the settlement, things were very difficult. No-one in the British Government had thought very hard about what sort of convicts should be sent to make a new colony. Nobody had chosen them carefully. There was only one man who was a farmer. There was no-one among the convicts who was a builder, a brick-maker or a blacksmith. No-one knew how to fix the tools when they broke. All of the cattle escaped. There were no cooking pots. All the plants were different so no-one knew which ones could be eaten. It was probable that everyone in the new colony would die of starvation. Somehow, the little group of tents with a hut for the Governor, Arthur Phillip, and another hut for the supply of food, grew into a small town with streets, a bridge over the stream, a windmill for grinding grain and wharves for ships. By the 1820s there was a fine brick house for the Governor. There was also a hospital and a convict barracks and a beautiful church which are still standing today. Settlements had spread out from Sydney, firstly to Norfolk Island and to Van Diemen's Land (Tasmania), and also up the coast to Newcastle, where coal was discovered, and inland where the missing cattle were found to have grown to a large herd. Spanish Merino sheep had been brought to Sydney, and by 1820, farmers were raising fat lambs for meat and also sending fine wool back to the factories of England. While the settlement was growing in New South Wales, it was also growing in Tasmania. The climate in Tasmania was more like that in England, and farmers found it easy to grow crops there. Governor Lachlan Macquarie was the 5th governor of New South Wales and one who though that Australia could be a rich and free place. Because Australia is such a very large land, it was easy to think that it might be able to hold a very large number of people. In the early days of the colony, a great number of explorers went out, searching for good land to settle on. When the settlers looked west from Sydney, they saw a range of mountains which they called the Blue Mountains. They were not very high and did not look very rugged but for many years no-one could find their way through them. In 1813 Gregory Blaxland, William Lawson and a 17-year-old called William Charles Wentworth crossed the Blue Mountains and found land on the other side which was good for farming. A road was built and the governor, Lachlan Macquarie founded the town of Bathurst on the other side, 100 miles from Sydney. Some people, like Captain Charles Sturt were sure that there must be a sea in the middle of Australia and set out to find it. Many of the explorers did not prepare very well, or else they went out to explore at the hottest time of year. Some died like Burke and Wills. Ludwig Leichhardt got lost twice. The second time, he was never seen again. Major Thomas Mitchell was one of the most successful explorers. He mapped the country as he went, and his maps remained in use for more than 100 years. He travelled all the way to what is now western Victoria, and to his surprise and annoyance found that he was not the first white person there. The Henty brothers had come from Tasmania, had built themselves a house, had a successful farm and fed the Major and his men on roast lamb and wine. The gold rushes of New South Wales and Victoria started in 1851 leading to large numbers of people arriving to search for gold. The population grew across south east Australia and made great wealth and industry. By 1853 the gold rushes had made some poor people, very rich. The transportation of convicts to Australia ended in the 1840s and 1850s and more changes came. The people in Australia wanted to run their own country, and not be told what to do from London. The first governments in the colonies were run by governors chosen by London. Soon the settlers wanted local government and more democracy. William Wentworth started the Australian Patriotic Association (Australia's first political party) in 1835 to demand democratic government. In 1840, the city councils started and some people could vote. New South Wales Legislative Council had its first elections in 1843, again with some limits on who could vote. In 1855, limited self-government was given by London to New South Wales, Victoria, South Australia and Tasmania. In 1855, the right to vote was given to all men over 21 in South Australia. The other colonies soon followed. Women were given the vote in the Parliament of South Australia in 1895 and they became the first women in the world allowed to stand in elections. Australians had started parliamentary democracies all across the continent. But voices were getting louder for all of them to come together as one country with a national parliament. 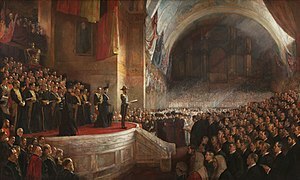 A painting of the opening of the first Parliament of Australia, 9 May 1901, painted by Tom Roberts. Australia has had democracy since the 1850s. Countries of birth of Australian estimated resident population, 2006. Until 1901, Australia was not a nation, it was six separate colonies governed by Britain. They voted to join together to form one new country, called the Commonwealth of Australia, in 1901. Australia was still part of the British Empire, and at first wanted only British or Europeans to come to Australia. But soon it had its own money, and its own Army and Navy. In Australia at this time, the trade unions were very strong, and they started a political party, the Australian Labor Party. Australia passed many laws to help the workers. In 1914, the First World War started in Europe. Australia joined in on the side of Britain against Germany, Austria-Hungary and the Ottoman Empire. Australian soldiers were sent to Gallipoli, in the Ottoman Empire. They fought bravely, but were beaten by the Turks. Today Australia remembers this battle every year on ANZAC Day. They also fought on the Western Front. More than 60,000 Australians were killed. Australia had a really hard time in the Great Depression of the 1930s and joined Britain in a war against Nazi Germany when Hitler invaded Poland in 1939. But in 1941 lots of Australian soldiers were captured in the Fall of Singapore by Japan. Then Japan started attacking Australia and people worried about invasion. But with help from the United States Navy, the Japanese were stopped. After the war, Australia became a close friend of the United States. When the war ended, Australia felt that it needed many more people to fill the country up and to work. So the government said it would take in people from Europe who had lost their homes in the war. It did things like building the Snowy Mountains Scheme. Over the next 25 years, millions of people came to Australia. They came especially from Italy and Greece, other countries in Europe. Later they also came from countries like Turkey and Lebanon. An important new party, the Liberal Party of Australia was made by Robert Menzies in 1944 and it won lots of elections from 1949 until in 1972, then Gough Whitlam won for the Labor Party. Whitlam made changes, but he made the Senate unhappy and the Governor-General sacked him and forced an election in 1975. Then Malcolm Fraser won a few elections for the Liberal Party. In the 1960s many people began coming to Australia from China, Vietnam, Malaysia and other countries in Asia. Australia became more multicultural. In the 1950s and 1960s Australia became one of the richest countries in the world, helped by mining and wool. Australia started trading more with America, than Japan. Australia supported the United States in wars against dictatorships in Korea and Vietnam and later Iraq. Australian soldiers also helped the United Nations in countries like East Timor in 1999. In 1973, the famous Sydney Opera House opened. In the 1970s, 80s and 90s lots of Australian movies, actors and singers became famous around the world. In the year 2000, Sydney had the Summer Olympics. In the 1980s and 90s, the Labor Party under Bob Hawke and Paul Keating, then the Liberal Party under John Howard made lots of changes to the economy. Australia had a bad recession in 1991, but when other Western countries had trouble with their economies in 2008, Australia stayed strong. Today Australia is a rich, peaceful and democratic country. But it still has problems. Around 4-5% of Australians could not get a job in 2010. A lot of land in Australia (like Uluru) has been returned to Aboriginal people, but lots of Aborigines are still poorer than everybody else. Every year the government chooses a big number of new people from all around the world to come as immigrants to live in Australia. These people may come because they want to do business, or to live in a democracy, to join their family, or because they are refugees. Australia took 6.5 million immigrants in the 60 years after World War Two, including around 660,000 refugees. Julia Gillard became the first woman Prime Minister of Australia in 2010 when she replaced her colleague Kevin Rudd of the Labor Party. The chamber of the Australian House of Representatives in Canberra. Australia is made up of six states, and two mainland territories. Each state and territory has its own Parliament and makes its own local laws. The Parliament of Australia sits in Canberra and makes laws for the whole country, also known as the Commonwealth or Federation. The Federal government is led by the Prime Minister of Australia, who is the member of Parliament chosen as leader. The current Prime Minister is Scott Morrison. The leader of Australia is the Prime Minister, although the Governor-General represents the Queen of Australia, who is also the Queen of Great Britain, as head of state. The Governor-General, currently His Excellency Sir Peter Cosgrove, is chosen by the Prime Minister. The Sydney Opera House was officially opened in 1973. Australia was colonised by people from Britain, but today people from all over the world live there. English is the main spoken language, and Christianity is the main religion, though all religions are accepted and not everybody has a religion. Australia is multicultural, which means that all its people are encouraged to keep their different languages, religions and ways of life, while also learning English and joining in with other Australians. Famous Australian writers include the bush balladeers Banjo Paterson and Henry Lawson who wrote about life in the Australian bush. More modern famous writers include Peter Carey, Thomas Keneally and Colleen McCullough. In 1973, Patrick White won the Nobel Prize in Literature, the only Australian to have achieved this; he is seen as one of the great English-language writers of the twentieth century. Australian music has had lots of world-wide stars, for example the opera singers Nellie Melba and Joan Sutherland, the rock and roll bands Bee Gees, AC/DC and INXS, the folk-rocker Paul Kelly (musician), the pop singer Kylie Minogue and Australian country music stars Slim Dusty and John Williamson. Australian Aboriginal music is very special and very ancient: it has the famous digeridoo woodwind instrument. Australian TV has produced many successful programs for home and overseas - including Skippy the Bush Kangaroo, Home and Away and Neighbours - and produced such well known TV stars as Barry Humphries (Dame Edna Everage), Steve Irwin (The Crocodile Hunter) and The Wiggles. Major Australian subgroups such as the Bogan have been shown on Australian TV in shows such as Bogan Hunters and Kath & Kim. Australia has two public broadcasters (the ABC and the multi-cultural SBS), three commercial television networks, three pay-TV services, and numerous public, non-profit television and radio stations. Each major city has its daily newspapers, and there are two national daily newspapers, The Australian and The Australian Financial Review. Australian movies have a very long history. The world's first feature movie was the Australian movie The Story of the Kelly Gang of 1906. In 1933, In the Wake of the Bounty, directed by Charles Chauvel, had Errol Flynn as the main actor. Flynn went on to a celebrated career in Hollywood. The first Australian Oscar was won by 1942's Kokoda Front Line!, directed by Ken G. Hall. In the 1970s and 1980s lots of big Australian movies and movie stars became world famous with movies like Picnic at Hanging Rock, Gallipoli (with Mel Gibson), The Man From Snowy River and Crocodile Dundee. Russell Crowe, Cate Blanchett and Heath Ledger became global stars during the 1990s and Australia starring Nicole Kidman and Hugh Jackman made a lot of money in 2008. Australia is also a popular destination for business conferences and research, with Sydney named as one of the top 20 meeting destinations in the world. Sport is an important part of Australian culture because the climate is good for outdoor activities. 23.5% Australians over the age of 15 regularly take part in organised sporting activities. In international sports, Australia has very strong teams in cricket, hockey, netball, rugby league and rugby union, and performs well in cycling, rowing and swimming. Local popular sports include Australian Rules Football, horse racing, soccer and motor racing. Australia has participated in every summer Olympic Games since 1896, and every Commonwealth Games. Australia has hosted the 1956 and 2000 Summer Olympics, and has ranked in the top five medal-winners since 2000. Australia has also hosted the 1938, 1962, 1982 and 2006 Commonwealth Games and are to host the 2018 Commonwealth Games. Other major international events held regularly in Australia include the Australian Open, one of the four Grand Slam tennis tournaments, annual international cricket matches and the Formula One Australian Grand Prix. Corporate and government sponsorship of many sports and elite athletes is common in Australia. Televised sport is popular; some of the highest-rated television programs include the Summer Olympic Games and the grand finals of local and international football competitions. The main sporting leagues for males are the Australian Football League, National Rugby League, A-League and NBL. For women, they are ANZ Netball Championships, W-League and WNBL. Famous Australian sports players include the cricketer Sir Donald Bradman, the swimmer Ian Thorpe and the athlete Cathy Freeman. Just 60 years ago, Australia had only one big art festival. Now Australia has hundreds of smaller community-based festivals, and national and regional festivals that focus on specific art forms. Australia is home to many animals that can be found nowhere else on Earth, which include: the koala, the kangaroo, the wombat, the numbat, the emu, among many others. Most of the marsupials in the world are found only on the continent. ↑ Australia's royal anthem is "God Save the Queen", played in the presence of a member of the Royal family when they are in Australia. In other contexts, the national anthem of Australia, "Advance Australia Fair", is played. ↑ English does not have de jure status. ↑ 3.0 3.1 There are minor variations from three basic time zones; see Time in Australia. ↑ "Pluralist Nations: Pluralist Language Policies?". 1995 Global Cultural Diversity Conference Proceedings, Sydney. Department of Immigration and Citizenship. Archived from the original on 20 December 2008. Retrieved 11 January 2009. "English has no de jure status but it is so entrenched as the common language that it is de facto the official language as well as the national language." ↑ See entry in the Macquarie Dictionary. ↑ Collins English Dictionary. Bishopbriggs, Glasgow: HarperCollins. 2009. p. 18. ISBN 978-0-00-786171-2. ↑ "Population clock". Australian Bureau of Statistics website. Commonwealth of Australia. Retrieved 1 July 2017. The population estimate shown is automatically calculated daily at 00:00 UTC and is based on data obtained from the population clock on the date shown in the citation. ↑ Australian Bureau of Statistics (27 June 2017). "Australia". 2016 Census QuickStats. Retrieved 27 June 2017. ↑ 7.0 7.1 7.2 7.3 "Australia". International Monetary Fund. October 2016. Retrieved 27 October 2017. ↑ "OECD Economic Surveys: Norway 2012". ↑ Statistics, c=AU; o=Commonwealth of Australia; ou=Australian Bureau of. "Australian Bureau of Statistics web site". www.abs.gov.au. Retrieved 2018-09-25. ↑ "Alcola World Alumina Australia" (PDF). MAMS.RMIT.edu.au. Retrieved December 11, 2014. ↑ Cummins, Brian R. (1990). Australia. Canberra: the Australian Government Publishing Service. pp. 16–17. ↑ Tanabe Yu (1997). Oceania South Pole. Shinjyuku ward: Asakura Bookstore. p. 3179. ↑ "Stone Pages Archaeo News: Australia colonized earlier than previously thought?". stonepages.com. 2003. Retrieved 28 March 2013. ↑ Takao Fujikawa (2004). The history of Australia. Tokyo: Yuhikaku ARMA. p. 4. ↑ Australian Bureau of Statistics. Retrieved 9 December 2007. ↑ Smith, Michelle (4 April 2014). ""Our fascination with "Bogans" will be televised"". The Conversation. Retrieved 19 November 2014. ↑ "Meet in Sydney". Business Events Sydney. Retrieved 2017-08-10. ↑ "About Australia". NDCA. Retrieved 2013-06-18. ↑ Australian government. "Art festivals". Retrieved 15 November 2010. Official website for australia travel Official website for Australia travel. Australia travel informations User generated guide to Australia.